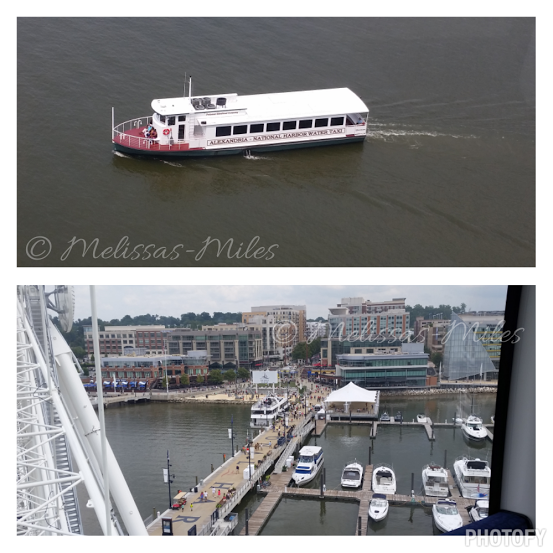 I’m on top of the “Wheel”!!! In exchange for my time and efforts in reviewing The Capital Wheel and giving my opinion on my blog, I have been provided with complimentary tickets. Even though I receive these benefits, I always give an opinion that is 100% mine. Have you ever wanted the top view, to look down at all the places and feel as if you were a giant? Maybe you just want to have a romantic view of the city, a breath taking glimpse and a moment of complete bliss. I had that moment this weekend… The romantic moment… The bliss moment… The I’m a giant moment… But also that moment of complete awh while being with my family. As we begun our day with a 3rd birthday party for our lovely neighbor’s little girl. Smiles and excitement built, due to the fact the birthday party was at the harbor already The Capital Wheel was already in our view. We proceed to have fun during a wonderfully themed Ariel birthday party, shells near the shore and the hit of the party a Merry-Go-Round. 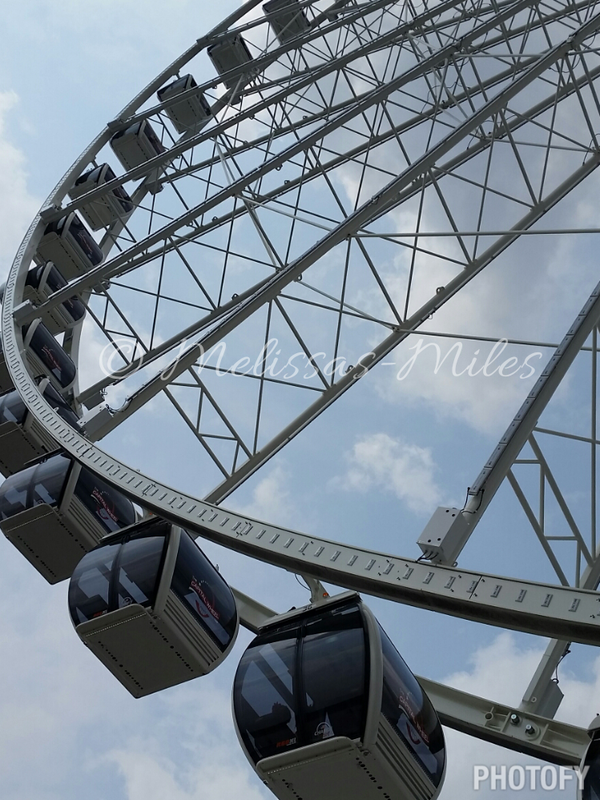 As we went around and around… And around some more The Capital Wheel in our site we all wonder what will this adventure be like. 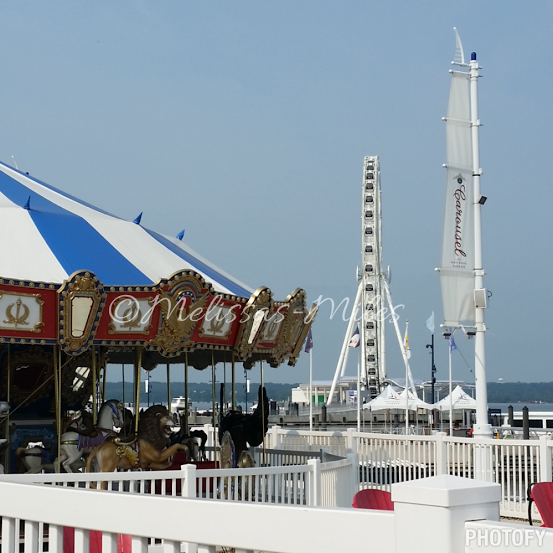 Yes I call it an adventure due to the fact one… I’m very scared of heights and two my girls have never been on a ferries wheel. What better way to begin our new adventure with small adventures, these are our first times for many things. As a young girl I always dreamed of that “romantic” moment, while looking out over a gorgeous view. Who knew this view who be our new “home”; after moving over 900 miles from living on the surface of the sun to this wonderful new start. The opportunities opening for us and the seasons changing (oh how I missed that). Isabella is ready to see the view. Our party of twelve quickly splits up into groups of four, families, and the adventure takes off. As The Capital Wheel begins to go around for its fifteen minute, birds eye view I watch as Geraldo and Isabella’s faces light up with excitement. 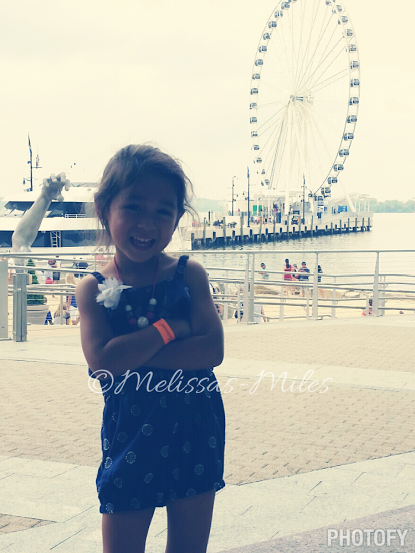 That moment is one of the first of many that would be taking my breath away; a moment that would last a life time as they laugh and hug… Isabella points at the Washington Monument, the Potomac River as boats passed and asking us if there are alligators and sharks… Yes she is a Florida girl and mommy taught her well. As I take the scenery in I can’t help but think how wonderful it is to sit with my family and look at the Monuments. 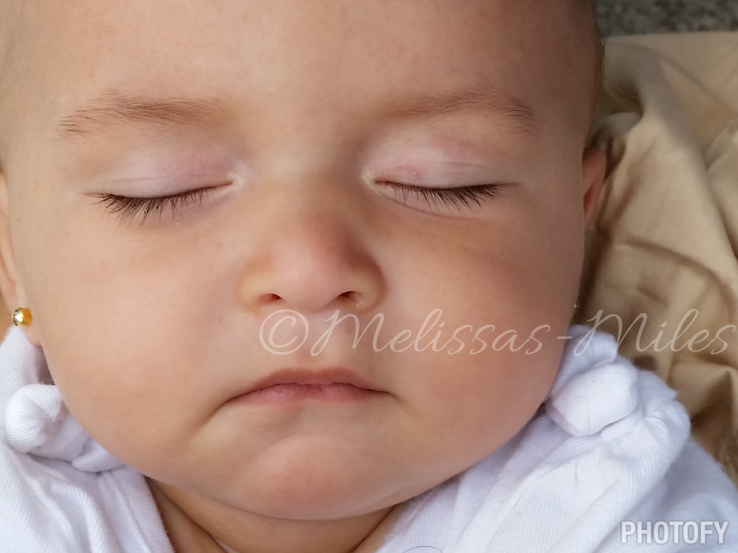 A relaxing moment to our non-stop days, as parents you appreciate those moments of complete silence (well almost). The smiles and laughs as we begin to wonder if we saw an otter or as Isabella kept saying “Rawr, rawr, rawr gator!!!”. 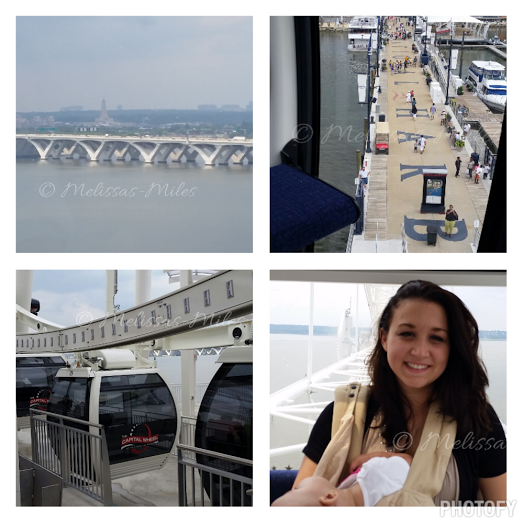 Sadly our first time on a The Capital Wheel as a family Elleanna is sleeping in our Ergo. Sleeping through the excitement, that’s our Elle. I’ve never had an experience like this, feeling on top of the world. All that comes to my mind now is the movie Titanic “I’m the king of the world!” Everyone can have that experience with The Capital Wheel and should, in my opinion. 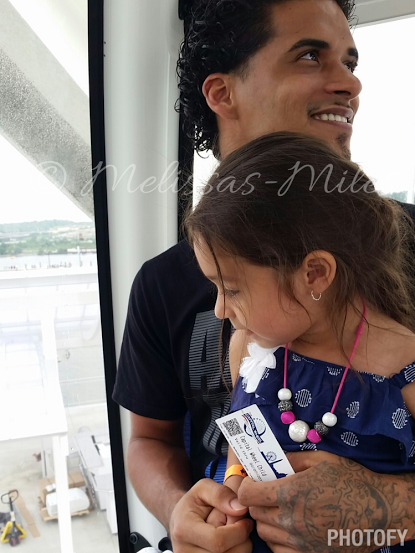 As we all had a wonderful time, watching my sister in the seating in front of us wave, laugh and smile we can certainly say The Capital Wheel is perfect for all ages. Quite enough with their soft music and smooth ride for a baby to sleep, amazing sights for adult and children to enjoy together. The breath taking moments of complete paradise. To end our time at The National Harbor, The Capital Wheel was perfection; a family bonding experience that just presented itself this May. Have you had a moment of complete paradise, a view from the birds eye? I hope that everyone has a chance to have this fantastic experience such as the one my family and I have had. Previous Post Marvel Universe Live: Whose side will you be on? Sounds like so much fun and a great family experience! I love the way u described ur advanture as a family like if i was reading a romatic family book I almost got tear to my eyes readin in how happy u guys are and how happy I am that u guys have a new beggin at some point everyone deserves that and why not u guy’s I love u huys to the end of time miss u so much ur best sister in law evvverrr muahzzzz!!! !